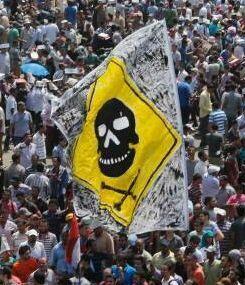 Spotted this flag in several Egypt protest pics today - does anyone know what it is? Grim Reaper is having a great week in Egypt. Even huge banners with the deathshead skull are being waved by crowds. Death is in the house! Death is a little bit short handed so he's working hard to whip people up into a death frenzy. Death Now Hiring, No Experience Necessary. ME: Death, I see you're having a banner week but the neighbors are offended by the horrible stench. Any comment? DEATH: Turn that camera OFF! I told you! You're gonna give death a bad name. DEATH: Don't fear the reaper. ME: Sorry, but I can't use your suggested headline "EGYPT WELCOMES DEATH". DEATH: I like you, kid. You know my history. You appreciate the classics. Come. Join me. Do you want to live forever? DEATH: Wait, I've seen your face before! Aren't you that scurvy little worm that helped turn the world against my boy Saddam and his sons? DEATH: I had a great gig going in Iraq for years, you ruined it. We were like family. By the way where did you say you live? ME: That's for me to know and for you to find out. You want my life? Come and take it. DEATH: Feisty one, aren't you? Must be Scottish. ME: I am but my Swiss, Dutch, English and French DNA can't stand your guts either. You smell terrible. DEATH: Tell me about it.